Complete the contact form and we'll be in touch. Bottlenose makes data analysis easy. Our machine learning, data mining, pattern recognition, and natural language processing capabilities enable our clients to institute change. The Nerve Center platform continuously aggregates and analyzes data across 2M+ digital and traditional data sources to construct timely, usable business insights. Use audience insights to develop data-driven strategies that attract and retain customers. Gather actionable insights prior to, during, and after financial events (filings, earnings, etc.) to develop a communications strategy that resonates with investment analysts, stakeholders, and investors. Extract market and competitive intelligence to inform company decisions and drive strategic direction. Protect your company and customers from malicious activity. This webinar will provide you with a playbook for data-driven decision making. Rely on more than just your gut, back up your decisions with complete business insights. Enterprises of every size are recognizing the strategic imperative of generating insights across the organization for complete business insight. The Bottlenose team has a passion for making machine learning, data mining, and predictive analytics easier than ever before. 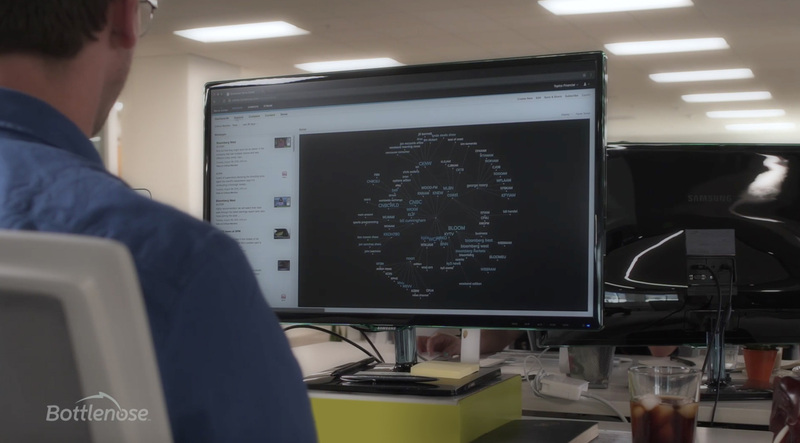 Our unique combination of data scientists, computer scientists, and solutions professionals work closely with our customers to bring these capabilities into reality so they can use them in their everyday work. Take a look for yourself at just how easy data analysis can be.